Wedfuly helped style a perfectly modern wedding at Space Gallery that has us swooning! When getting married in an art museum, there isn’t a need for a ton of decor, and the decor for this wedding inspiration was simple and elegant. The reception table was full of greenery and metallic accents that allowed for the decor to stand out on its own. 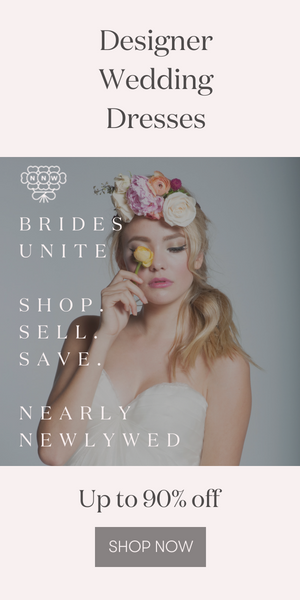 The brides’ A&Be Bridal Shop wedding dresses are classicly beautiful with a modern twist! From the decor to bridal style, there is so much to love in this intimate wedding inspo! Thanks to photography duo Kenz & Nick, we can all obsess over all of the details and the sweet love between the brides! The biggest thank you to Kenz & Nick for sharing this museum wedding inspiration with Junebug! For more intimate wedding vibes, take a look at how this modern Luce Loft wedding achieves the moody look with marble details.